Harrington Raceway's 69th season of live harness racing came to a close Thursday afternoon with a 15-race program. End of meet honors were presented to familiar faces for the leading driver and trainer. Allan Davis, won his second straight driving title with 150 wins at the meet and is on pace for his best year yet as he looks to close out with his third consecutive year with more than 300 wins. Davis is the son of local driving legend Eddie Davis, who won more than 8,000 races in his career. More than $550,000 in total purses were up for grabs as part of a showcase of Delaware's top bred horses Wednesday at Harrington Raceway in the penultimate program of the 2015 meet. Four $100,000 Delaware Standardbred Breeders Fund (DSBF) final events were the centerpiece of the 13-race program, as well as their accompanying $20,000 consolations. Cicada's Song shattered the 2-year-old trotting track record Wednesday in her $20,000 DSBF filly elimination with a 1:59.2 victory for trainer Carlo Poliseno and owner Jane Dunavant. Just eight days from their $100,000 final event, three $20,000 elimination divisions were held Tuesday at Harrington Raceway for Delaware Standardbred Breeders Fund (DSBF) 2-year-old pacing colts and geldings. The first leg of action for the Delaware Standardbred Breeders Fund (DSBF) stakes for 2-year-old pacing colts and geldings highlighted a 14-race Tuesday program at Harrington Raceway. Mach It So spoils "Foiled"
Bamond Racing's Mach It So ($18.60, Tim Tetrick) sprung an upset in Monday's $150,000 Bobby Quillen Memorial at Harrington Raceway with a 1:51.1 triumph. Michael Casalino's Tough Mac ($3.80, Jon Roberts) was victorious in the $16,000 Open Trot Wednesday at Harrington Raceway in 1:55.3. Art and Andrew Stafford's Framed Art ($9.20, Art Stafford Jr.) was a wire-to-wire winner in Monday's featured $12,500 Open II in 1:50.4 at Harrington Raceway. The win was just a fifth of a second off the track record for aged pacing stallions (Dancin Yankee). Janet Hudson’s Just a Jolt ($3.20, Victor Kirby) notched his second straight $40,000 Governor’s Cup Thursday at Harrington Raceway with a 1:51.2 triumph as part of the annual Governor’s Day program during the Delaware State Fair. 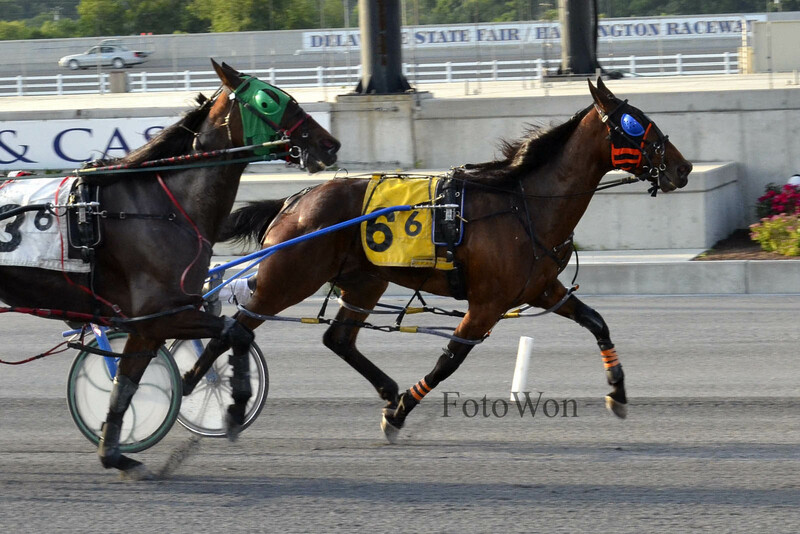 The stage is set for the richest program for Delaware horses of the season as Governor's Day during the Delaware State Fair will showcase many of Delaware's finest Thursday. Go Byem's 1:56.3 dominant score was the fastest of the DSBF 3-year-old trotters Wednesday for co-owner/trainer and driver Les Givens. A total of 21 Delaware Standardbred Breeders Fund (DSBF) pacing fillies completed their second leg of stakes action Tuesday at Harrington Raceway. In a mild upset, Quick Art ended the unbeaten 2015 run for Remember Me Vk in the second leg of the DSBF stakes. 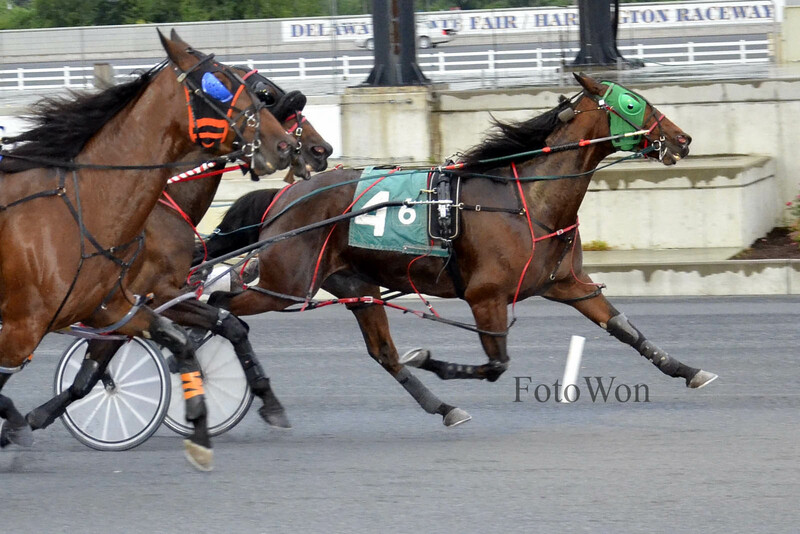 Wednesday marked the commencement of the Delaware Standardbred Breeders Fund (DSBF) stakes for 3-year-old trotters at Harrington Raceway with five $20,000 divisions. Three $20,000 divisions of the DSBF stakes for pacing fillies were contested on Tuesday as 22 fillies initiated their pursuit of reaching the $100,000 Final on July 30. Two $20,000 divisions of the Delaware Standardbred Breeders Fund (DSBF) stakes for 3-year-old pacing colts and geldings highlighted the Monday program at Harrington Raceway. Six Gun Hall reset the track record for aged trotting horses Wednesday with a dazzling 1:54.4 mile in the $12,500 Open II Trot. J&M Racing's Embassy Seelster continued her stellar 2015 Harrington Raceway meet with a 1:53.2 triumph in the $16,000 Mares Open Tuesday. Daryl Bier's Bandolito ($2.60) was ultra impressive in his dominant 1:51.4 win in the $16,000 Open Pace Monday. Jim King Jr. and Tim Tetrick's Powerful Charger ($8.40, Victor Kirby) notched his seventh win of the year Wednesday in his 1:54.1 triumph in the $16,000 Open Trot at Harrington Raceway. For the second straight evening, a Josh Green-trained horse took the feature race Tuesday at Harrington Raceway as Also Encouraging was one of four driving winners for Allan Davis in the $16,000 Mares Open. L&J Racing Inc.'s EZ Noah (Tony Morgan, $2.60) continued to relish the Delaware air with his third straight win, this one in 1:51.4, Monday in the $16,000 Open Pace at Harrington Raceway. Legacy Racing of Delaware and Reginald Hazzard's Rolls Blue Chip ($5.20, Allan Davis) won his Delaware debut Wednesday with a 1:55.3 triumph in the $16,000 Open Trot at Harrington Raceway. Jason and Susan Skinner's Bj's Sweetheart kept her high win percentage going Tuesday with a 1:54.2 triumph in the $10,000 featured conditioned pace. L&J Racing's EZ Noah ($3.80, Tony Morgan) notched his second straight win Monday at Harrington Raceway with a 1:52.2 triumph in the $16,000 Open Pace. William Cantrell's Classic Belisima ($4.80, Jon Roberts) won her sixth straight race Wednesday in the $16,000 Open Trot at Harrington Raceway in 1:55. John McGill's Star Keeper ($6.80, Jim Morand) capitalized on a perfect trip to score her 27th career win Tuesday in 1:54.4 in the $16,000 Mares Open at Harrington Raceway. L&J Racing Inc's EZ Noah (Tony Morgan) returned to Harrington Raceway a winner Monday with a 1:51.2 triumph in the $16,000 Open. Jim King Jr. and Tim Tetrick's Powerful Charger (Victor Kirby, $2.60) notched his sixth win of the year Wednesday with a 1:55.3 triumph in the $16,000 Open Trot at Harrington Raceway. J&M Racing Inc.'s Embassy Seelster ($10, George Dennis) successfully defended her turf Tuesday as a repeat winner in the $16,000 featured Mares Open at Harrington Raceway in 1:52.3. Ron Short's Charger ($33.40, Allan Davis) was an upset winner in achieving his third consecutive win Monday in the $12,500 Open II at Harrington Raceway. The 10-year-old altered son of Stampede Hanover was dismissed at 15-to-1 and set all the fractions in a narrow win over a fast closing Special T Rocks. Shiretown Pitbull was parked the entire mile and finished third. Pick four players will have extra incentive to handicap Harrington Raceway’s Monday May 25 Memorial Day program, as a $5,000 guaranteed pool has been added to the popular wager. J&M Racing Stable's Embassy Seelster ($10.80, George Dennis) set a new track record for aged pacing mares with a 1:51.3 triumph in the $12,500 Mares Open II at Harrington Raceway. Janet Hudson's Just a Jolt ($7.20, Victor Kirby) notched his 25th career win Monday in the featured $16,000 Open at Harrington Raceway in 1:52. 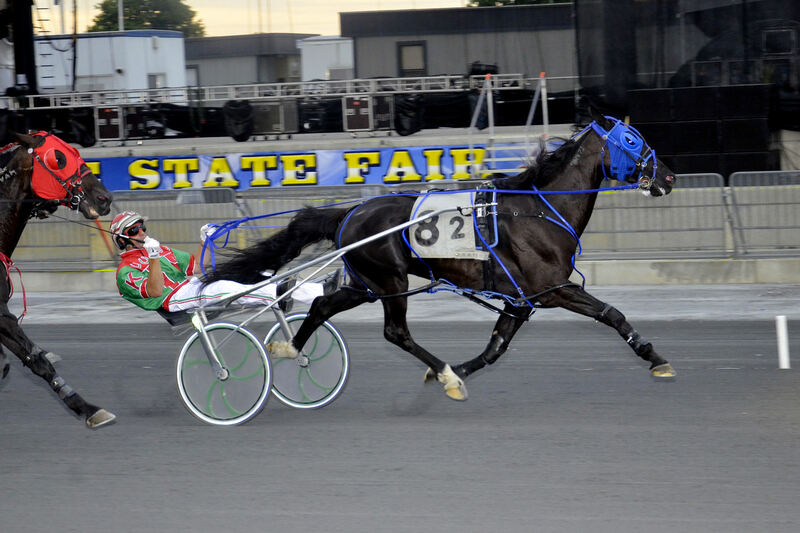 Traverse Seelster ended his string of three straight second place finishes this year with a decisive score in 1:55 in the $16,000 Open Trot Wednesday. 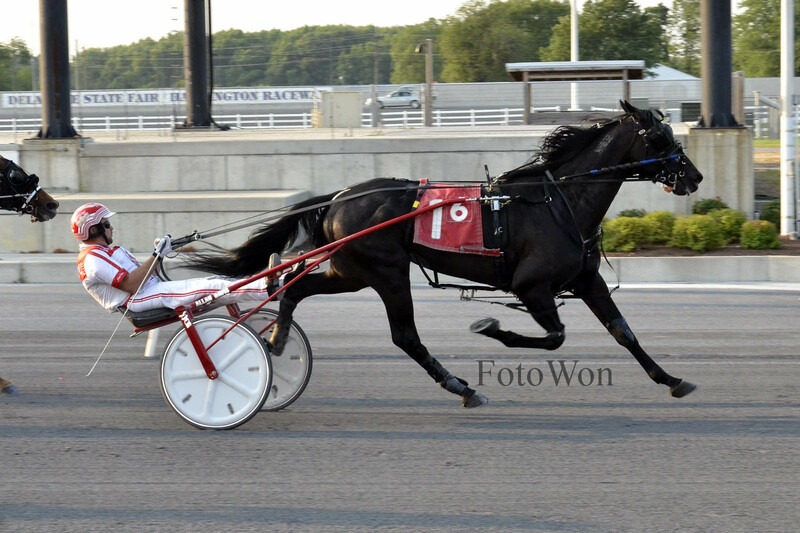 Reggie Hazzard's A La Notte Hanover ($28.60, Allan Davis) was an upset winner in the $12,500 Mares Open at Harrington Raceway Tuesday in 1:53.4. George Teague Jr.'s Wiggleitjiggleit ($2.10, Montrell Teague) put forth an amazing world record performance Monday with a 1:49 win at Harrington Raceway as he remained unbeaten in eight career starts. A field of six talented trotters with 125 career combined lifetime wins lined up behind the starting gate in Harrington Raceway's $16,000 featured Open Trot Wednesday. When the dust settled it was Jim King Jr., and Tim Tetrick's Powerful Charger ($10.40, Victor Kirby) earning his second straight win in 1:54.3 over Traverse Seelster and Wingus. 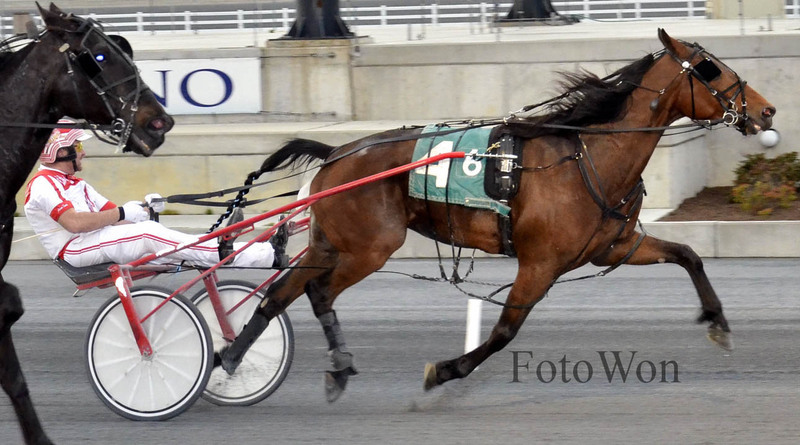 San Fran Lady N ($3.60, Ross Wolfenden) notched her eighth win of the season Tuesday with a 1:52.2 victory in the featured $12,500 Mares Open II at Harrington Raceway. Janet Hudson's Just A Jolt ($2.60, VIctor Kirby) repeated in Monday's $16,000 Open Pace Monday in 1:51.4. Powerful Charger put forth a menacing bid late to capture Wednesday's $16,000 Open Trot in 1:55. Legacy Racing of Delaware's Hit By Lightning ($41, Jim Morand) was a 19-to-1 upset winner in the $12,500 Mares Open II Tuesday. Janet Hudson's Just A Jolt ($3) was one of five winners driven by Victor Kirby as the pacer notched his 23rd career win Monday in the $16,000 Open Pace at Harrington Raceway in 1:51.4. Locally-owned I Like My Boss ($10, Allan Davis) notched his 19th win in 36 career starts Wednesday at Harrington Raceway with a 1:55.1 win in the $16,000 Open Trot. Daryl Bier's Bandolito ($3, Bier) notched his fifth win of the year Monday on opening day at Harrington Raceway with a dazzling 1:51 win in the $15,000 Delaware Special. Harrington Raceway will open its doors for its 69th season of live harness racing Monday April 20. Fans are encouraged to take advantage of $1 live racing programs and $1 hot dogs in celebration of opening day. There will also be a hat giveaway (while supplies last) at 5 p.m. in the lower grandstand. Racing will be conducted on a Monday through Thursday schedule. Post time is 5:30 p.m. The 2015 racing packets, which include a roster application, are now available online. Horsemen are reminded that the deadline for submission is April 7. Liability releases for the upcoming season must also be on file at this time and are available with the packet. To access this information, along with a racing calendar, please visit harringtonraceway.com/horsemen/racepacket/ . The season of gift giving didn’t end on Christmas Day at Harrington Raceway and Casino this year. The holiday spirit was extended into Boxing Day (December 26) as Harrington Raceway and Casino and its customers teamed up for a wildly successful food drive throughout the day that netted more than 12,000 cans of food to benefit the Food Bank of Delaware.